Inspire Space part-funded Laura Keogh, to attend the International Space University (ISU) Space Studies Programme 2016 (SSP16) in Haifa, Israel. 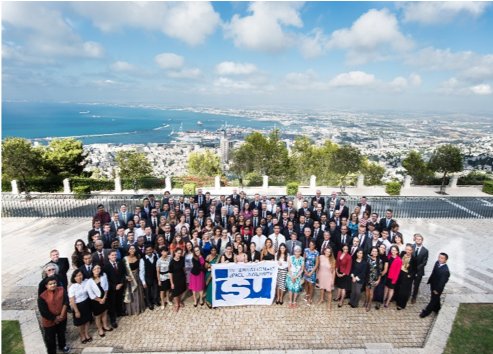 The International Space University’s Space Studies Programme for 2016 (ISU SSP16) took place in Haifa, Israel. The ISU was set up in 1987 and with that, the SSP was born. The SSP wanted to provide space enthusiasts from all around the world, from any background, with the chance to gain a holistic understanding of the space sector. The SSP takes place once a year, during summer, in the Northern Hemisphere. In addition, what is known as SSPSH takes place once a year in the Southern Hemisphere, during their summer. Each year both the SSP and SSPSH attract many people from all walks of life and all age groups. Thanks to the funding from Inspire Space and ESA I was lucky enough to be able to attend SSP16. There were one hundred and five people from twenty-three different countries taking part in SSP16. The average age of people in attendance was thirty-five, ranging from twenty-two year olds to fifty year olds. Each person had a different set of expertise. This year there were artists, engineers, doctors, lawyers, business experts and, of course, students. However, our love for space gelled any cultural and professional differences, as well as any age gaps. The core lecture series ensures that everyone is on the same footing when it comes to space knowledge. Lectures range from ‘space culture’ to ‘space law’ and of course to astronomy and orbital mechanics. During the core lecture series there are also evening events with distinguished speakers. This year we were lucky enough to hear from Jeffrey Hoffman and Buzz Aldrin (the second man on the moon! ), to name two. The departmental activities allow participants to choose a space discipline to specialise in; the choices range from law and business, to engineering and space applications. I chose the Engineering Department. Definitely the best experience in the Engineering Department was driving a rover at the Canadian Space Agency Mars Yard in Montreal from a lab in Haifa, Israel. The team projects are a way to demonstrate the skills you have learned throughout the SSP, as well as an opportunity to show your skills that you brought from home. There are usually three projects to choose from. Each team must produce an executive summary, a final report, which is usually 100 pages long, and a final presentation. Each group has roughly thirty-five team members. Thus, it is a test of your ability to work in an interdisciplinary and intercultural team, reflecting the realities of the space sector. There was a huge workload, but it was not all work! Throughout the SSP there are culture nights, where each participant is given the chance to share a part of their culture via food and dancing. There is also a weekend, entitled Alumni Weekend, where space enthusiasts from other years come and pay a visit to the current SSP participants. The signature event of the Alumni Weekend is the Space Masquerade. I, along with several others, dressed up as the Mercury Seven and we took home first prize in the group dress-up competition. During SSP16, we also got to see some of Israel, with excursions to Jerusalem and the Dead Sea. There was also a start-up weekend, which enabled participants to test their business ideas, with the best idea getting €5,000. Finally, if you are wondering where we slept and what we ate, you are always given accommodation and three meals a day throughout the SSP. The accommodation is usually single-bed student accommodation. As my SSP was in Haifa, I was very lucky to have a view over the Mediterranean ocean! The food was incredible, and there was no shortage of choice. The aim of the ISU is to prepare people for the space sector, to work in an international, intercultural and interdisciplinary environment. It is considered that these are the essential characteristics for success in the space sector, since space is inherently an international adventure. The ISU constantly required us to remember that we need cooperation if we are to continue to achieve success in space. I would like to take this opportunity to thank Inspire Space, without whom I would not have been able to attend SSP16. I have learned so much and have made friendships that I know will last a lifetime. Details for how to apply for funding to attend ISU is available during the application process – there are different scholarship options depending on your home country. Irish students can apply for ESA and Inspire Space funding, among others. Where students were unable to receive a full scholarship, many people were able to gain sponsorship from private companies, so there are many options. Information is also available on the Inspire Space website.